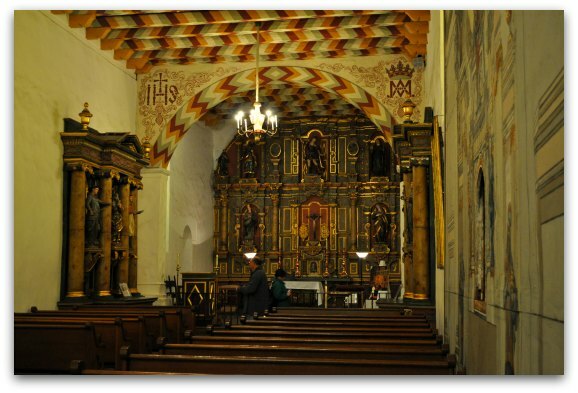 The Mission San Francisco de Asis was the sixth mission built under the direction of Father Junipero Serra. Completed in 1791, it is the oldest building in San Francisco. 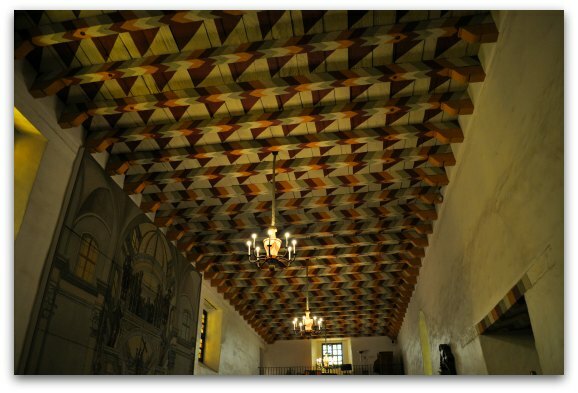 It is also the oldest intact mission in California. 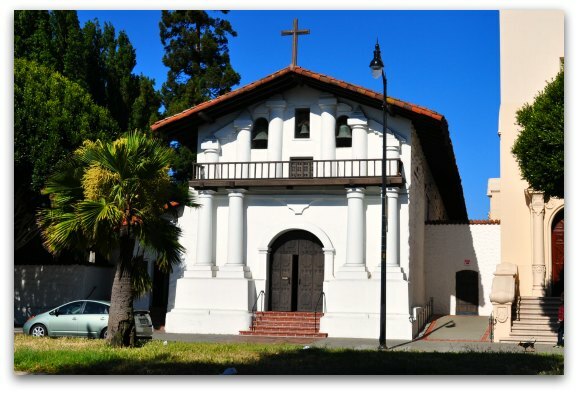 Commonly referred to as the Mission Dolores, this historic building sits on the western side of the Mission District. Both this building and the newer basilica are right on the corner of 16th and Dolores. Below are pictures from my last visit and a few details on what to expect when you step inside. The stable construction of the Mission San Francisco de Asis held up during both the famous 1906 earthquake and the more recent 1989 Loma Prieta earthquake. It's sturdy four foot thick adobe walls are now painted white. However, you can still see a small piece of the darker, original adobe walls in the museum inside of it. Today, a visit here includes access to the original chapel, the basilica, a small museum and the original cemetery. Your first stop during your visit is the chapel. The chapel is still a working church and holds regular masses. 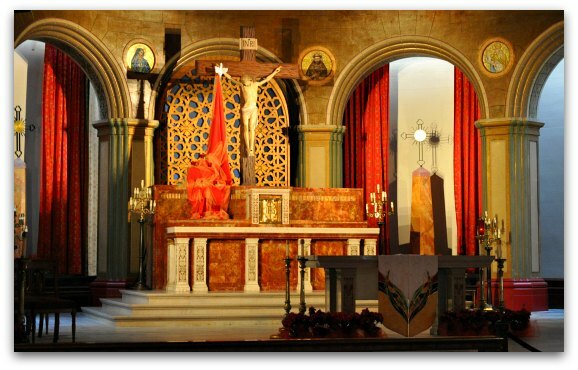 The center piece is the front alter which arrived here in 1796 from San Blas, Mexico. The two side alters arrived a few years later from Mexico in 1810. During your visit, you can learn more about each part of these three alters and what each figure represents. One part of the church that is hard to miss is the colorful ceiling. These are the original redwood logs installed during the initial construction it. However, they do repaint the ceiling when needed to help it maintain its beauty. 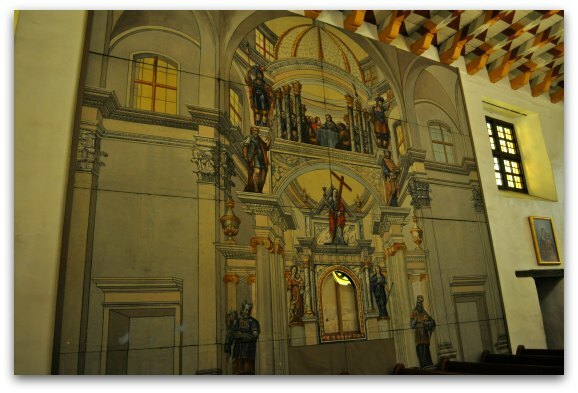 This image showcases part of a beautiful, detailed mural on the northern wall inside the chapel. This is one of four burial places inside the chapel. 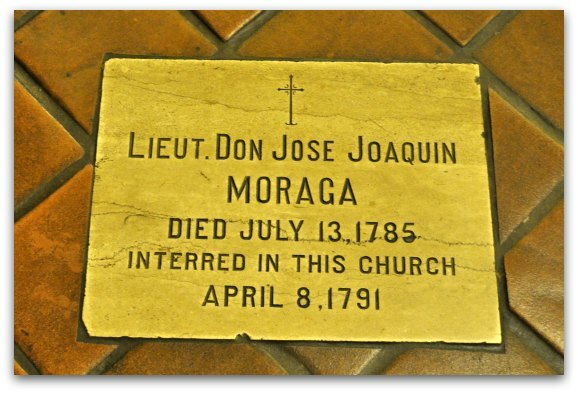 This one is for Lieutenant Jose Joaquin Moraga, the leader of the 1776 expedition to find a location for a new mission. His team and he settled on the current location and construction started a few years later. 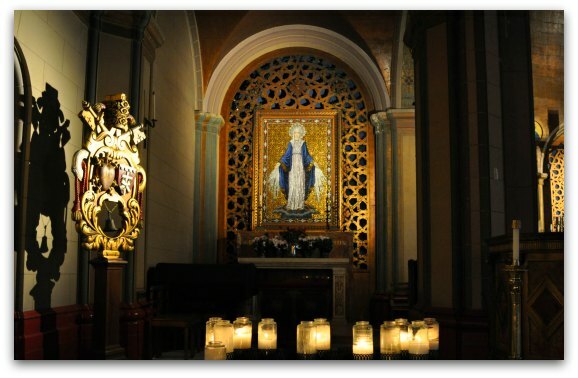 Others buried inside the chapel include William Leidesdorff, an Afro-American pioneer businessman of the city; the Noe Family, Jose de Jesus Noe was the last Mexican mayor of San Francisco; and Very Reverend Richard Carroll, the first pastor of Mission Dolores after SF became an Archdiocese. Make sure to look around for these during your visit to the church. The original basilica was built around the same time as the Mission. However, it collapsed during the 1906 earthquake. After the earthquake, they rebuilt the current basilica in 1918. The basilica is much larger than the chapel. It is also still a working church with regularly scheduled masses. The woodwork, stained glass and details on the alter showcase the care given to the recreation of this part of the Mission San Francisco de Asis. The is a side view of the main alter in the basilica. Pope Pius XII designated this as a basilica in 1952. All basilicas are honorary Churches of the Pope. One of two ornate side alters in the basilica. This one sits to the left of the main alter. 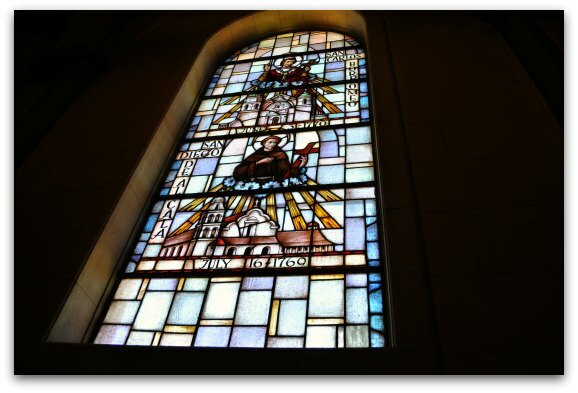 This is one of 21 stained glass windows depicting the dates and names of all of the missions in California. They line up along the lower walls of the basilica. 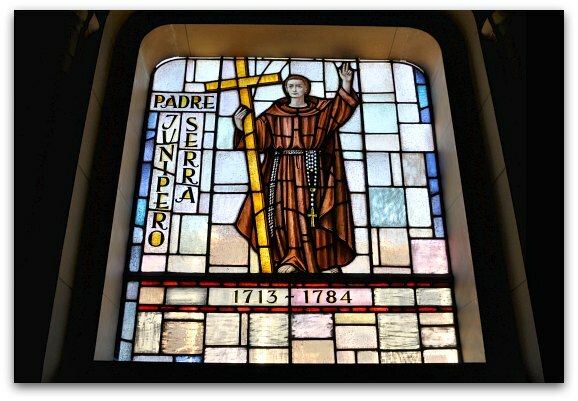 In addition to these 21 stained glass windows, there are also two more honoring Father Junipero Serra and Father Palou. The last part of your visit will be a walk through the old cemetery. The majority of the graves date back to around 1830 to 1898. 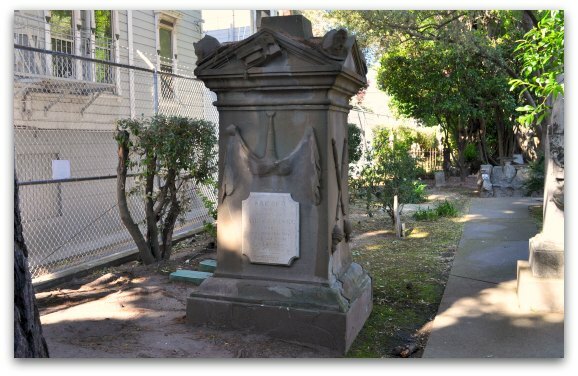 This is one of only three cemeteries inside the city limits of San Francisco. Although the current cemetery is just a fraction of the original, you will still find important people of this time buried here. The best way to locate them is to first stop at the directory when you enter. It shows the names of everyone buried here. It also notes the most important people in the cemetery. 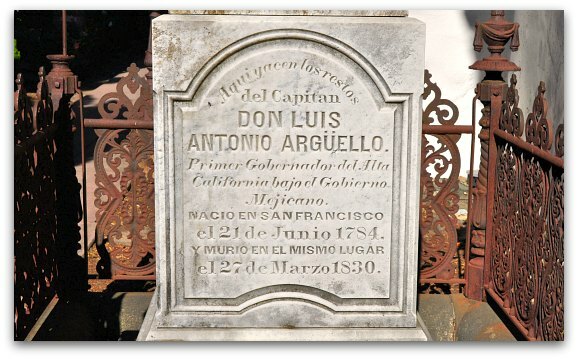 The prominent grave of Don Luis Antonio Arguello, the first governor of Alta California under Mexican rule. His grave is to the left of the cemetery entrance, right next to the southern wall of the Mission San Francisco de Asis. 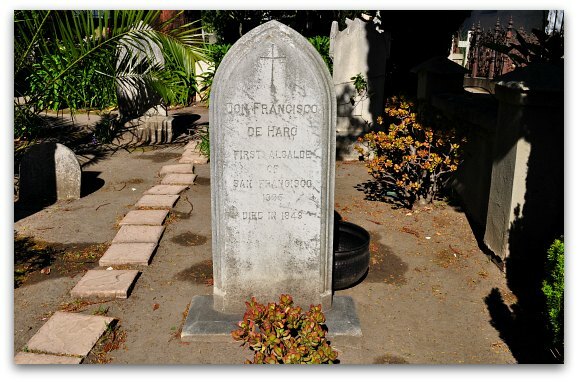 Another prominent person buried here is Don Francisco de Haro. He was the first Mayor (Alcalde) of San Francisco. You can also see the repairs done to the two grave stones behind this one. Since this is such an old cemetery, you will see these types of repairs throughout the cemetery. Three other notable people buried here are James P. Casey, Charles Cora, and James "Yankee" Sullivan. All three were convicted by the San Francisco Vigilance Committee in the mid 1850s. This community based organization fought and punished "criminals" and corrupt government officials. The grave above is that of Casey. He was publicly hanged along with Cora. Sullivan committed suicide in 1856 in his cell while he was being held by the committee. The Mission San Francisco of Asis is open every day of the week except Thanksgiving, Christmas and New Year's Day. Their hours vary slightly by season. The suggested donation for visiting is $5 for adults and $3 for students and seniors. You are also welcome to join them for mass. You do not have to pay the donation to attend mass. This is the current schedule. The chapel or basilica is closed to visitors during mass. However, it reopens immediately after the service. If you happen to visit during the mass, you can stick around for the service to end and then visit that part of the mission. The entire visit to the Mission San Francisco de Asis takes about an hour to an hour and a half. It is set up well and easy to get through quickly. It's also a great option for those that love history and want to learn more about the earlier times in San Francisco. 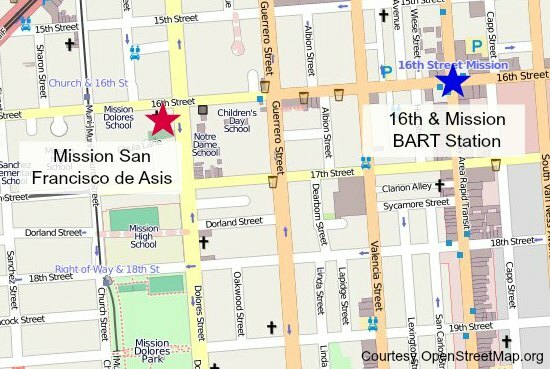 BART: The quickest way to get from Union Square to the Mission is using BART. You can hop on at any station near Union Square. Exit at the 16th Street and Mission Station. After exiting the station, head west about three and a half blocks. Below is a map with the walking route from the station to this attraction. You can also find a map of the BART system on the public transportation San Francisco page. Bus: If you are coming from Fishermans Wharf, your best option is to take the Mission 49 bus. It picks up on the western side of Fishermans Wharf and takes you directly into this district. Hop on the bus at the corner of Van Ness and North Point. You will exit the bus at 16th and Mission. The map above shows how to walk from that drop off point over to the entrance of the Mission San Francisco de Asis. Taxi: Taking a taxi is another option. From Union Square, it will cost around $15 to get here. It will cost you a little more from Fishermans Wharf -- around $20 to $25. Find out more about taking one of the SF taxis. Car: Taking a car is another option. Parking on the street is quite difficult in this neighborhood, so I recommend parking in one of two main Mission garages. Find locations, pricing, etc. on the San Francisco parking garages page.